If flipping the calendar from November to December left you feeling stressed, we can help! 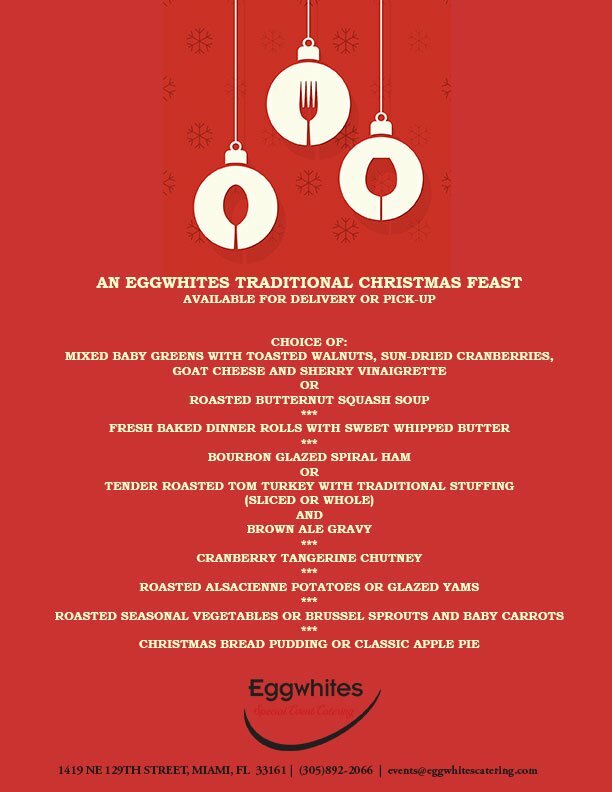 Eggwhites Catering is preparing an elegant Christmas dinner delivery menu that features a variety of traditional holiday favorites so you can serve a magnificent feast that your friends and family won't soon forget! Your Christmas dinner will be prepared fresh and delivered to your door ready to be heated and served (or you may save a little money and pick it up from us at our commissary in North Miami). With over 24 years of preparing delicious food for holiday dinners and all types of parties, let our chef-owned and operated catering company take care of the holidays for you this season! Your Christmas dinner will be delivered in disposable, oven-safe serving containers which will make clean-up a snap! So put on a festive sweater - it's time to enjoy the celebration and this most magical time of year! !